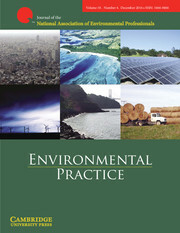 Environmental Practice provides a multidisciplinary forum for authoritative discussion and analysis of issues of wide interest to the international community of environmental professionals, with the intent of developing innovative solutions to environmental problems for public policy implementation, professional practice, or both. Peer-reviewed original research papers, environmental reviews, and commentaries, along with news articles, book reviews, and points of view, link findings in science and technology with issues of public policy, health, environmental quality, law, political economy, management, and the appropriate standards for expertise. The journal is now available through Taylor and Francis and is available to view here.